The Nissan Terrano XV “Premium” here reviewed is the prettier (through subtle sheet metal changes) and the relatively more expensive non-identical twin of the ubiquitous Renault Duster, discernibly a product of the Nissan-Renault “strategic partnership” that is propelling the latter further forward in India. “Kaizen Nissan” was kind enough to provide me access to the car and what follows is my fleeting impression of the Terrano over the course of a weekend and a few kilometres. 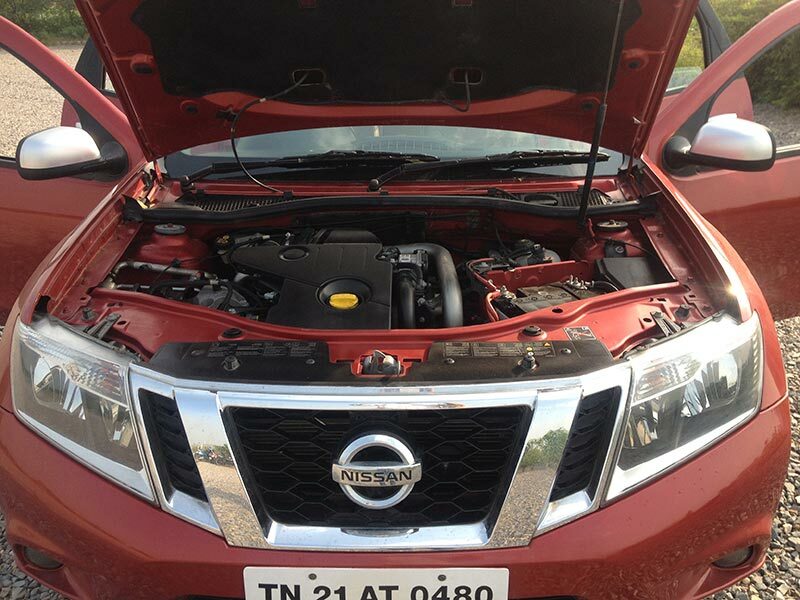 The Terrano is a good looking car (“fire red” colour on review car) from all viewing angles and though I am not in favour of chrome in modern cars, the same is used tastefully both in the front grille next to the Nissan logo and in the rear tailgate, accented by the smart headlamp and tail-light design. The car feels well engineered and all parts click and thump into place reassuringly. The top model that I was provided with also had the factory alloy wheels that look smart and go well with the overall design theme and ride on 215/65 R16 Tubeless’. 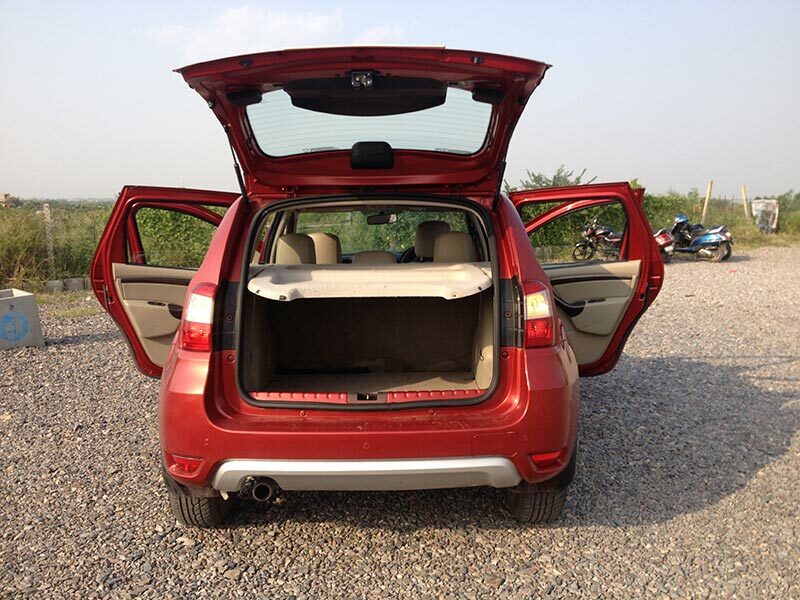 As the top model, the XV “Premium” comes with all options ticked, not least of which are front airbags, leather seats and rear parking sensors, alloy wheels. 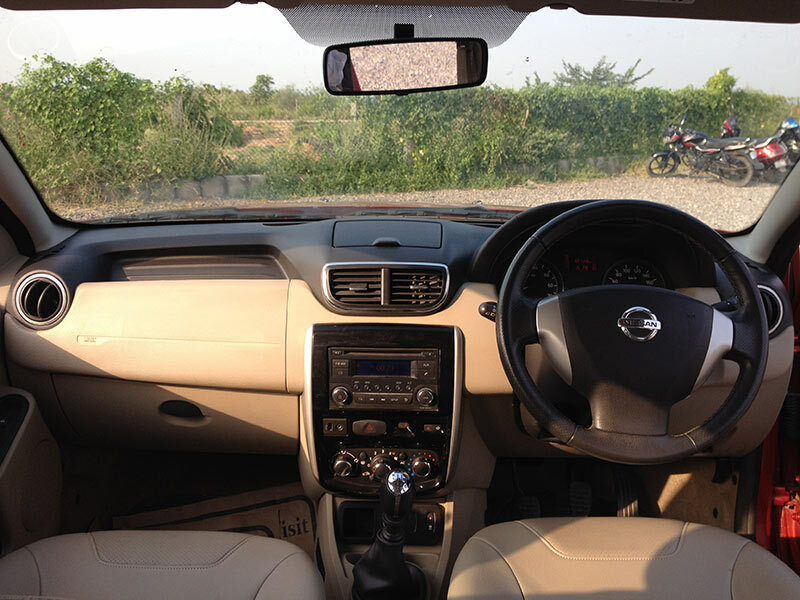 The Terrano cabin is airy, with light coloured materials, seats 5 in great comfort with efficient cooling from the airconditioner and has a generous 475 litres in luggage carrying capacity. That apart, the interior design, build quality and layout of the Terrano in my subjective opinion is still the weakest link in the otherwise compelling case put forth by Nissan, and could prove to be its Achilles’ heel with the likes of Hyundai Creta for competition. Everything though works well, but unfortunately in some instances is not conveniently located (door mirror adjustment switches under the hand brake, central locking button on the central console), feels cheaply made to the touch (aircon controls and general switchgear quality) or uses outdated technology (entertainment system and central information display in-dash), and lacks the visual design appeal in general (dashboard and instrumentation look and display). A big omission to my mind in the interior features list is the lack of a central armrest for at least the driver and an inexplicable rear aircon vent design that should have been the armrest, housing the rear aircon vents as an integrated feature below, prevalent in most high-end cars today and steering wheel mounted function buttons for entertainment etc. 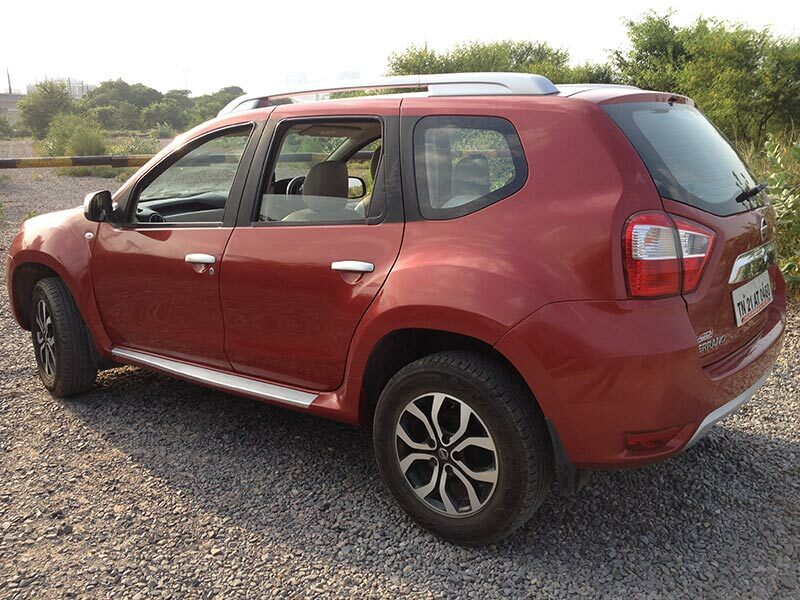 The Terrano with a 205 mm of ground clearance on 16’s rides extremely well notwithstanding the quality of the road surface and feels very sure footed on the move. There is a slight feel of weight to the chunky steering especially when changing directions, but that to me is welcome and only adds to the robust feel and balance of the car. The Terrano is also quite agile for a car of its size and is extremely manoeuvrable, with a remarkably small turning radius and direct steering to provide an air of confidence and some small measure of invincibility. In my drive through some extremely poor surfaces (termed as “roads” officially) in Delhi and Gurgaon, never once did the suspension feel inadequate and nor did any loud thumps or creaks filter through to the cabin area. The braking prowess of the Terrano is also unquestionable with good brake pedal feel and operation, and the XV “Premium” featured here comes with ABS (Anti lock Braking System), EBD with BA (Electronic Brakeforce Distribution with Brake Assist) and front discs and rear drums combination. 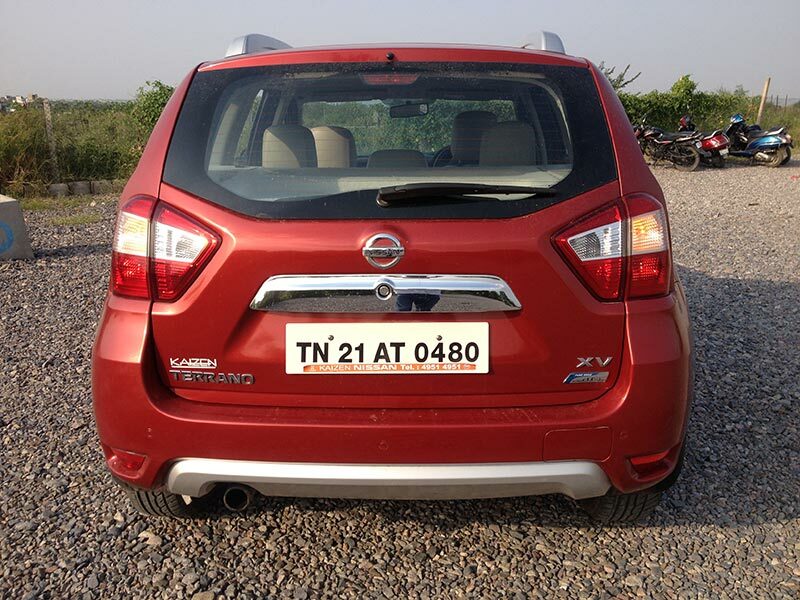 Along with the extremely well dialled-in ride and handling, the stand out feature of the Nissan Terrano XV irrefutably is its “1.5 dCi THP” diesel engine as mated to its 6-speed manual gearbox. The 1461 cc, 4 Cyl In-Line generates a stated max power of 110 PS (approx 108 bhp) @ 3900 rpm and a stated max torque of 248 Nm @ 2250 rpm. Whilst the numbers might not be impressive on paper, in real world driving conditions of India, it is near perfect and all the performance you need. The engine impressively, is quite inaudible for a diesel, especially on the move and provides a refined and smooth power delivery through a equally impressive and precise 6 speed gearbox. The more than adequate torque on tap allowed me to pick up the Terrano from second gear from a stand-start and in-gear acceleration and response is more than adequate for city traffic and highway cruises. Though the meat of the power and torque band is around the 2500 rpm mark, I found the Terrano happily pulling itself around in 3rd and 4th gears at a few ticks over the 1200 rpm levels, and demonstrates the incredible robustness and refinement of the engine, of a capacity that one would normally associate being used to service small hatchbacks and entry level sedans. Nissan claims around 19 kms to a litre of diesel, in my experience that is not too far off the mark as ably aided by the 6 speed gearbox, which for a car of its size and capabilities is another remarkable feature to be taken due notice of by the mileage sensitive consumer. I was provided a full tank of fuel (as per the electronic fuel gauge display), and despite driving the car over 120 odd kilometres with the aircon on at all times, I could not get the gauge to dip. 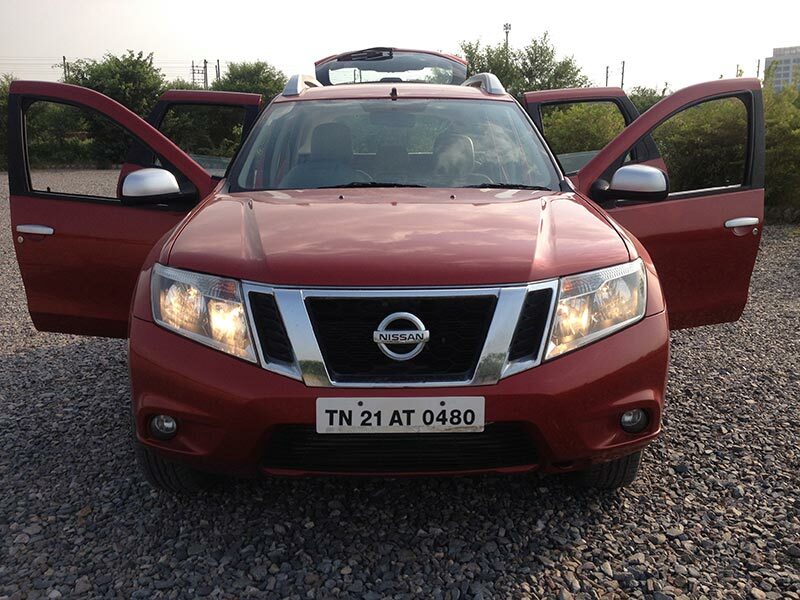 The Nissan Terrano XV “Premium” is the top specified model and retails at Rs.12.91 lacs (ex-showroom Delhi). The Terrano range starts at approx Rs.10 lacs and offers the detuned version of the diesel engine featured here at a lesser price as well as a petrol version of the car. 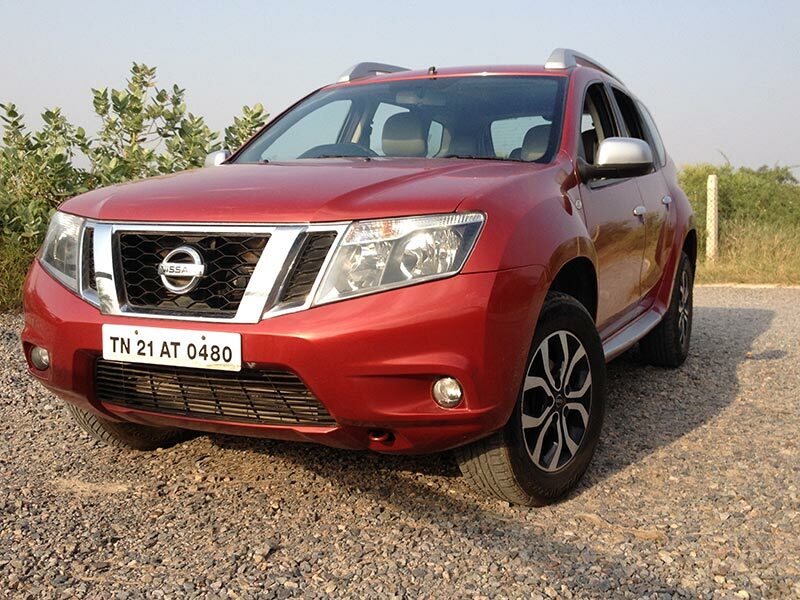 The Terrano is good looking and well built, with the ability to tackle what India offers in abundance, bad roads. The diesel engine on offer is extremely capable, refined and fuel efficient and feels built to last. The raised ground clearance and mini SUV look also provides the much sought street-cred and a sense of safety to its occupants. The interiors of the Terrano unfortunately fall a bit short to an otherwise compelling offering from Nissan and given that the potential owner would spend more time inside rather than admiring the Terrano from the outside, the necessary changes can’t come any sooner with the mini SUV market’s increasing competitiveness fuelled by ever increasing demand. However, for me, the only optional feature that I would like to tick and which could possibly also make the Terrano standout from its competition, is what Nissan does not even offer at present, 4WD. Anand is an Advocate and Solicitor with Chaudhuri & Associates. Check out his work at MinusTax.com.